Previously, I presented photos and descriptions of a microcontroller and motherboard designed for detecting sunlight. The method for providing the actual motion of the device is provided on this page. A DC geared motor is located in the center of the device to rotate towards the sun when commanded by the microcontroller. I selected a high-precision Maxon motor (118638) for its reliability, compact size (13 mm), small weight (42 grams), and powerful torque (67:1 110315). Unfortunately, I learned later that it isn’t particularly high-efficiency (only 68% maximum without accounting for the gearhead). I made the efficiency worse by driving it at a much lower voltage than its 15 V optimal rating. But, that’s what happens when you buy your motors second hand rather than to your own specification. That’s right, the motor has a sweet encoder that is not even going to be used. I purchased a FH21-5S-1DSA five position FPC/FFC connector to mate with the flex cable. The connector is soldered to a small PCB with ordinary wires for motor power. 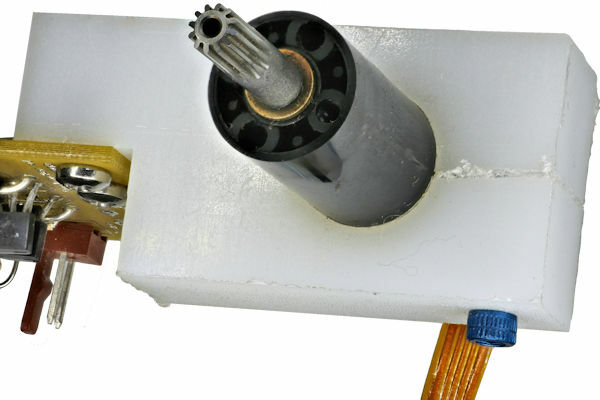 The motor is clamped into a block of HDPE (high-density polyethylene). Even though polyethylene does not machine smoothly, HDPE is relatively unaffected by moisture, which is important for an outdoor application. Also, this type of plastic resists stress cracking, which is important because it is clamping a motor in place. HDPE does not have good UV resistance, but would be expected to be shaded from the sun by a solar panel. Because the mounting block does not need precise dimensions, I roughly positioned the drill using the motor. 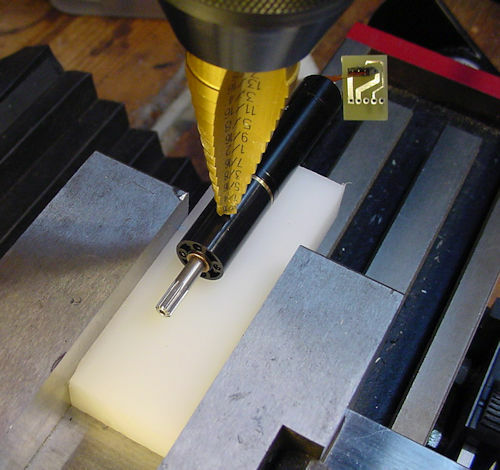 Trying to plunge a 13 mm drill directly into the material can stall the drill machine or mar the workpiece. Usually, a series of increasing diameter drills are switched out to safely create a large-diameter hole. Alternatively, a step drill is a special type of drill bit that includes a series of diameters on the same shaft. This can increase the hole size without needing to change out multiple drills. Although this workpiece is thicker than the depth of each step, the step drill can still effectively remove the majority of the excess material in a single pass. 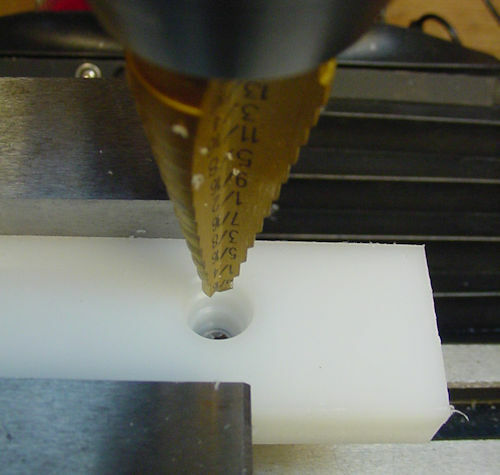 Afterwards, the correct sized (13 mm) drill can drill through the block in a single pass. 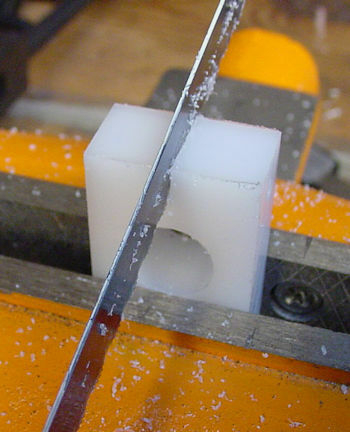 After drilling, a hacksaw splits one end of the block. A screw is drilled perpendicular to the split to tighten the gap after the motor is in place. (Additional details are listed on my motor clamp block project.) For this project, the screw is anodized aluminum, which resists corrosion. The sensor bus is the primary reason I gave up on this project. 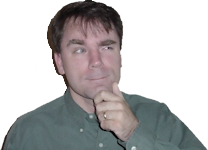 I believe diodes will solve the problem, but a diode’s reverse leakage current may still interfere with readings. Furthermore, the sensors themselves are not matched to follow the same brightness/resistance curve. So, a lower resistance sensor may indicate brightness in a relatively darker direction. Additionally, the sensor wires are bent enough that they don’t all aim along the exact same plain. A sensor that is pointed slightly up may also give a false indication of increased brightness by seeing more of the horizon. Secondarily, the Solar Tracker just didn’t look as nice as I envisioned it in my head. I definitely need to add a stabilizer bar from the motor block to the opposite side of the wire loop to keep it from drooping. Perhaps some sort of enclosure to protect the electronics could also improve the appearance.